The rear half of ex MO 2146, one of the first bendys into Australia. ex MO 9375 being used for parts. Good Shots... Those Busses Look Rather Old And Run Down Are they Still Being Used? Kid wrote: Good Shots... Those Busses Look Rather Old And Run Down Are they Still Being Used? ex MO-9375 is used for parts and ex MO-2146 was retired from service recently and replaced by an ex STA Merc 0305G Artic. MAN artic ex MO-9375 would be a good choice for preservation.It might be difficult to find some replacement sliding windows like that style though. Do you or anyone else have any interior shots of these by any chance? I can remember them only slightly, as I was young when these things went and without a camera! Kid, put your glasses on, it can't be any more obvious that these buses are no longer in service! 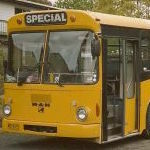 Now, has anyone noticed the windows were swapped between the two buses some years ago? (it was once discussed).... ex 9375 is only an ex ACTION unit. ex 2146 being the unit worthy of having it's windows returned from 9375 and being preserved. Last edited by MAN_LOVER on Wed Sep 27, 2006 10:47 pm, edited 1 time in total. Kid wrote: Are they Still Being Used? Considering That They Have No NumberPlates, A Number Of Windows Missing, Articulations Are Broken, Lights Missing, Etc... Obviously Not. No... I didn't need to post that with a capital letter at the start of every word, and neither did you. Views expressed by me are strictly my own, not of my friends, employer, or anyone else. Nexas wrote: No... I didn't need to post that with a capital letter at the start of every word, and neither did you. I guess even Germany's finest have to come to an end at some point. The dismissal of Gough Whitlam's cabinet was still a recent event when these made their first appearance in Canberra's streetscape. So was my birth . Well, here I am, discovering this almost 10 years after the original post, but I have to say I am extremely saddened to see ex MO 9375 in such a derelict, unsalvageable state. That used to be my school bus in the late 1990s/early 2000s. The other almost identical one I sometimes rode was ex MO 9597, which I understand ended up being sold to a company in New Zealand.